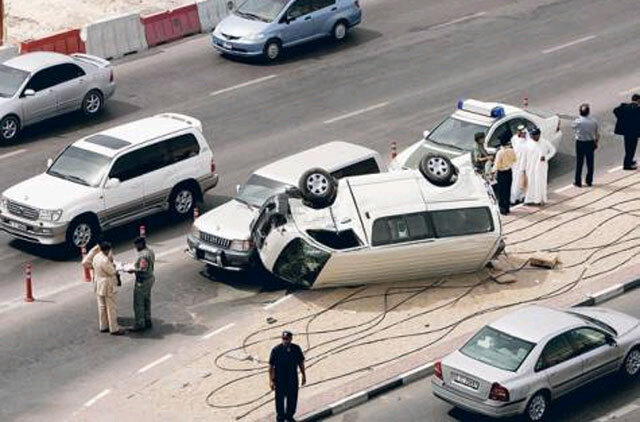 Dubai: More than 1,812 emergency calls were made to police on Monday morning as a number of traffic accidents broke out across the city. The Dubai Police Command and Control Unit said it also recorded 66 traffic accidents from 6 am to 9 am due to weather conditions. Brigadier Saif Muhair Al Mazrouei, Director General of Traffic Department at Dubai Police, urged motorists to keep a safe distance between cars and adjust their speed to the weather. "Allow extra time for your journey and check your planned route. It’s also advisable to slow down as rain makes roads slippery," he said. Brig. Al Mazrouei attributed the accidents to low road visibility during bad weather, pointing out that police did not record any serious accidents or injuries. "People should follow safety instructions and regulation to avoid any accidents," he said. It’s worth nothing that Dubai Police have stepped up the level of readiness to deal with any incidents in the mountainous areas and places of running flood and neighboring areas. The force has also stepped up the level of readiness in the desert areas, which have been recently popular among members of the public due to change in temperatures. Dubai Police have increased the number of patrols in mountainous areas to be always ready to deal with emergencies 24 hours a day. Residents are advised to stay away from places of water pools and valleys when the weather is unstable. Motorists are also urged not to use their vehicles across desert areas, especially after the rains, because of the high risk involved.